Live video assistance provider, Vee24, announces today that specialist bathroom retailer, bathstore, is using the Vee24 live video solution to provide online customer service to its customers. 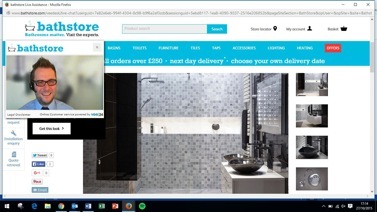 bathstore’s online customers are now greeted on the bathstore.com website by a live video assistant who can help them select products, offer advice, book a design consultation and assist them through the checkout process. The live assistance service, Live Help, is available seven days per week from 9am to 10pm. “Purchasing a new bathroom is a considered decision for customers and it’s often good to talk through options, weigh up different products and seek some reassurance, which is typically difficult to do on a website. Live Help is a great way to meet a customer when they are browsing, in pretty much the same way you’d greet them in store. Early results are excellent and we’re delighted to see bathstore customers embracing the new service,” said Phil Adams, client success director at Vee24.